Beavers- the largest North American rodents, recognized by their rich brown fur, webbed hind paws, and large, flat tails- were trapped almost to extinction in North Carolina as well as in much of eastern North America during the colonial period, their valuable pelts being an important item of trade in the colonies. 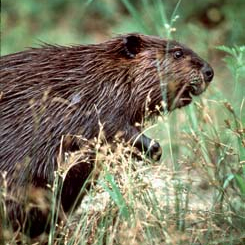 The last reported native North Carolina beaver was seen in Stokes County in 1897. In 1939 the agency that became the North Carolina Wildlife Resources Commission released 29 Pennsylvania beavers in the Coastal Plain in what is now the Sandhills Game Land. The beavers thrived, and by 1953 their population, estimated at 1,000 animals, stretched into seven counties. Because their pelts remained valuable, the stocking program was continued between 1951 and 1956, with 54 beavers released in nine other counties. By the early 2000s, beavers&emdash;natural engineers that take down trees to create dams and shallow ponds&emdash;had become so successful that regulated trapping was necessary in some regions to diminish timber damage and flooding in populated or agricultural areas. Although sometimes causing damage, beaver ponds also provide ideal habitats for creatures such as kingfishers, muskrats, and wood ducks. In fact, North Carolina's native wood duck population and harvests have increased concurrent with the rise in the beaver population. Megalos, Mark A.; Jones, Edwin J. and Turner, J. Chris. "Working with wildlife #23: Managing Beaver Ponds." North Carolina Cooperative Extension Service. 199?. http://digital.ncdcr.gov/u?/p249901coll22,433610 (accessed September 25, 2012). Bromley, P. and others. Beavers. Wildlife Damage Management, N.C.Cooperative Extension Service. AG 472-4, Oct. 1994.